Former state senator Brian A. Joyce collected about $1 million in bribes and kickbacks that he laundered through his law firm, according to a sweeping 102-page indictment that accuses the Milton Democrat of turning his public office into a criminal enterprise — even accepting hundreds of pounds of free coffee from a Dunkin’ Donuts owner. Joyce, once the Senate’s assistant majority leader, was taken from his Westport home in handcuffs early on Friday morning and escorted by federal agents to be booked and fingerprinted, and face federal charges of mail fraud, corruption, money laundering, and embezzlement, among many others. Acting US Attorney William Weinreb said prosecutors launched the investigation of Joyce after a series of stories by The Boston Globe that began in January 2015 looking at Joyce’s mingling of public and personal business. Weinreb said investigators estimated that Joyce’s many illegal schemes have netted him about $1 million since 2010. Prosecutors say, among other things, Joyce extorted a Jeep from a Milton developer and collected more than $100,000 in phony legal fees from a Dunkin’ Donuts store owner in exchange for using his influence to help them. 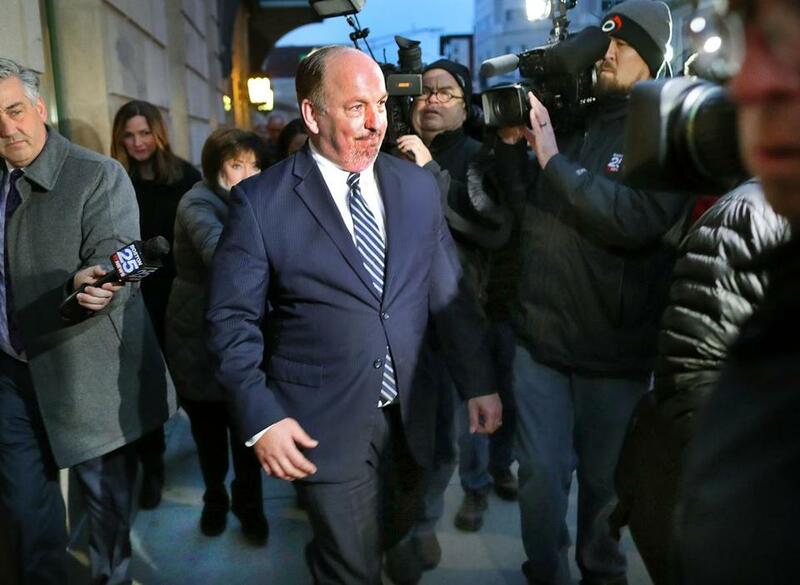 Former state senator Brian A. Joyce, once one of the state’s highest-ranking legislators, is under arrest and facing federal indictments, the US attorney’s office said. Late on Friday afternoon, Joyce appeared in a federal courtroom in Worcester, roughly 10 hours after his arrest, in a dark blue suit and a tie. He nodded to his wife and other family members. Standing before US Magistrate Judge David Hennessy, Joyce pleaded not guilty to all the charges before he was released on $250,000 secured bond. The case was continued until a status hearing on Feb. 23. Joyce must surrender his passport, and his travel is restricted to Massachusetts and Rhode Island. “You just heard former senator Joyce declare in a very loud and affirmative voice in federal court that he is innocent of all these charges and he expects that’s what will happen in court,” said Joyce’s attorney, Howard Cooper, outside the courtroom as Joyce stood by his side. The 113-count indictment describes Joyce as someone who considered his duties as an elected public official secondary to his goal of secretly amassing wealth, a goal he would achieve by using the power of his Senate office to help those who allegedly provided bribes and kickbacks to him. “Defendant Joyce’s objective in conducting and participating in the affairs of the Senate Office . . . was to secretly profit from his position as State Senator [by] . . . accepting a stream of concealed bribes and kickbacks from private individuals and entities in exchange for his official action as specific opportunities arose,’’ the indictment reads. Joyce is accused of using his law office, the Joyce Law Group in Canton, “as a money laundering conduit for the corrupt payments” by labeling the bribes and kickbacks as legal referral fees and consulting fees for working on real estate issues, and by using the “corrupt payments” to buy a 2014 Jeep, according to the indictment. 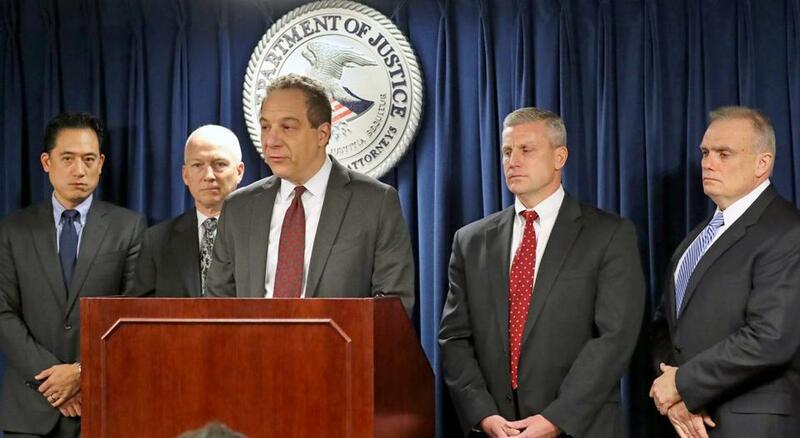 US Attorney William D. Weinreb addressed the media about the Joyce indictment. A developer seeking help with Milton town officials is accused of handing over the Jeep to Joyce without demanding he pay the $20,000 due on the purchase price, authorities allege. The developer, John Morrill, who owns two car dealerships, has been a longtime political supporter of Joyce. Under one scheme, federal authorities allege, Joyce spent $471,250 to purchase 65,000 shares in a company, Energi, whose business activities he was actively supporting on Beacon Hill. But Joyce never disclosed his financial ties to the company and falsely claimed the money he used to buy the stock came from a tax-free rollover of an IRA account. “Defendant Joyce created sham retirement accounts for himself and his spouse in order to conceal his stock ownership from the Ethics Commission and to defraud the IRS,’’ the indictment alleges. Joyce is also accused of collecting hundreds of pounds of coffee — along with $125,089 in “purported legal fees” — from a Carlos Andrade, a major Dunkin’ Donuts franchisee who sits on the Dunkin’ Donuts foundation board of directors. On one occasion in 2015, he collected 504 pounds of coffee, worth an estimated $4,278, for free, authorities allege. When the Globe asked Joyce how he obtained the free coffee in 2015, he had someone else make up a fake invoice and backdate it, the indictment alleges. At the time, his lawyer insisted Joyce had paid full retail price, like anyone else. Governor Charlie Baker told the Globe that the charges against Joyce should be a warning to anyone in public office. Joyce had been an early supporter of then Senate President Stanley Rosenberg, who appointed him assistant majority leader in 2015 and made him chairman of the committee that decided which bills would come up for a vote. Now, Joyce is facing more than 100 criminal charges, outpacing the corruption counts leveled against other politicians in recent years, including former House speaker Sal DiMasi and former state senator Dianne Wilkerson, who was charged with one count of bribery. DiMasi was sentenced to eight years after he was convicted of helping a software company win multimillion-dollar state contracts in exchange for kickbacks. Wilkerson was sentenced to three and a half years. If convicted on all counts, Joyce could face far more jail time. Some of the counts in the indictment carry possible sentences of up to 20 years each. But Joyce’s attorney Cooper suggested that the charges against his client are the work of overzealous federal prosecutors. “I should add that, in the last few years, it has been very apparent across the country that the federal government has brought a number of cases against public officials, which have either gone nowhere, or have been rejected by juries, or have been highly criticized by the courts,” Cooper said. The charges against Joyce represent a stunning fall from grace over the past two years. Joyce, 55, decided not to run for reelection in 2016 — and moved out of Milton, his longtime hometown — after the FBI and IRS raided his Canton law office. The raid followed a series of stories published by the Globe describing some of the ways in which he appeared to use his public position to get private benefits for himself and his family. Joyce aroused suspicions by repeatedly receiving discounted and sometimes free goods and services, often from businesses in his legislative district. For instance, when he was angling for a Senate leadership position in late 2014, he gave his Senate colleagues expensive sunglasses that he got at a significant discount from a company in his district, as well as pounds of Dunkin’ Donuts coffee. Joyce also received free dry cleaning from a Randolph dry cleaner for more than a decade, services worth thousands of dollars. Neither the sunglasses nor the dry cleaning were mentioned in the indictment. 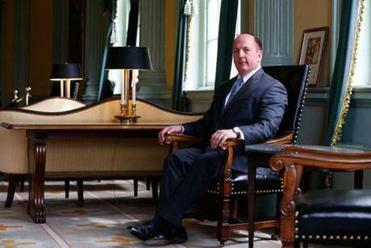 Through his attorney, Joyce denied any wrongdoing. He said he bartered the dry cleaning for legal work and paid for coffee and sunglasses the same price as anyone else. The Globe also wrote extensively about Joyce’s relationship with Energi, the Peabody company that is the subject of much of the indictment. The company, which sells insurance to the energy industry, hired Joyce and his law firm to do legal work and to handle regulatory matters before the state Division of Insurance. Between 2010 and 2015, the company paid the Joyce Law Group $377,169 in fees, according to the indictment. Even so, Joyce apparently wanted more legal business and fees in return for his help with a bill promoted by the company. He filed the bill and spoke at a symposium sponsored by Energi promoting the bill — never disclosing his ties to the company. Energi put him on retainer, paying him $5,000 a month for approximately five months. “We intend to cooperate fully with the government . . . and we regret that we too were victimized by Mr. Joyce,” said Brian Kelly, a lawyer who represents Energi. The indictment also describes Joyce’s relationship with a company that sells solar credits, Power Management, referred to in the indictment as the “energy broker.” The company paid him “secret kickbacks” for his help in landing the company energy consulting work with the towns of Randolph, Easton, East Bridgewater, Southbridge, and Holbrook, the indictment said. He created a shell company, “Windswept LLC,” where he deposited the kickbacks, the indictment says. In Milton, where he lived until this year, he allegedly approached developer John Morrill about buying and redeveloping the Milton Women’s Club, a historic building that had fallen into disrepair, the indictment says. Joyce pressured the planning board to allow Morrill to take actions that would allow Morrill to build four houses on the site. In return, the indictment says, Morrill agreed to pay Joyce a kickback — a 2014 Jeep from one of his dealerships. Morrill also agreed that Joyce’s wife, Mary, a local realtor, would be a sales broker for the homes built on the site. Joyce was also accused of using his position to try to extract a $25,000 fee from a Philadelphia-based solar company, Tecta Solar. The company was looking for help with legislation and permitting for a project in West Bridgewater. “Yeah, I can get the permit for you,” Joyce told Tecta officials. “It would be through my law firm, and our fee would be $25,000 . . .’ according to the indictment. Company officials told the Globe in 2015 that they were stunned by his request and declined to hire him. “It was suggested we could retain him, but we never pursued it. It was certainly not our intent and it was twisted in a completely different direction,” said Samir Dube, who was then the company’s managing director. Joshua Miller of the Globe staff contributed to this report. Andrea Estes can be reached at estes@globe.com. Milton J. Valencia can be reached at milton.valencia@globe.com. Follow him on Twitter @miltonvalencia. John R. Ellement can be reached at ellement@globe.com. Follow him on Twitter @JREbosglobe.